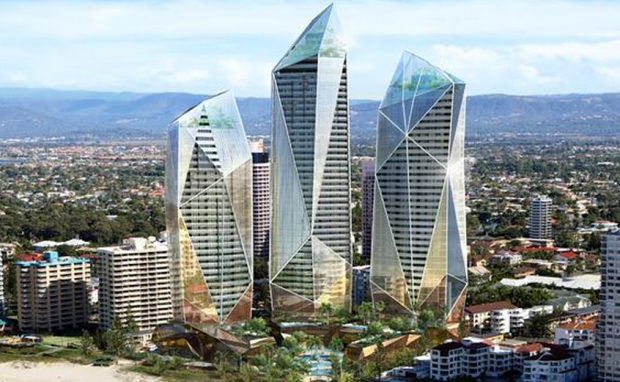 Buyers from Hong Kong and Sydney have signed contracts off the plan for two luxury apartments totalling more than $7 million in the Jewel apartment tower project on the Gold Coast, The Australian reported. The newspaper said that marketing on the $1 billion three tower project, being built by Chinese partners Dalian Wanda and Ridong Group, has now commenced. Wanda Ridong Group has held events for buyers in Sydney, Hong Kong and mainland China over the past week. Sales and marketing director Andrew Bampton told The Australian a Sydney couple had purchased a three-bedroom apartment for $5 million on level 38 while a two-bedroom apartment on the 26th floor sold for more than $2m at the launch in Hong Kong this week. Wanda Ridong has appointed CBRE to handle sales in Australia. The project will include 512 apartments and a Wanda Vista--branded hotel. Mr Bampton told The Australian that apartments would be released for sale in small lots of about 50.